Commissioned and produced by the Samdani Art Foundation for the Dhaka Art Summit 2016. Courtesy of the artists, Dhaka Art Summit, Samdani Art Foundation and Jhaveri Contemporary, Mumbai. Image Credit: Jenni Carter. Iftikhar Dadi and Elizabeth Dadi first presented Magic Carpet at the Queens Museum in 2005 where it hovered over a map of New York City. 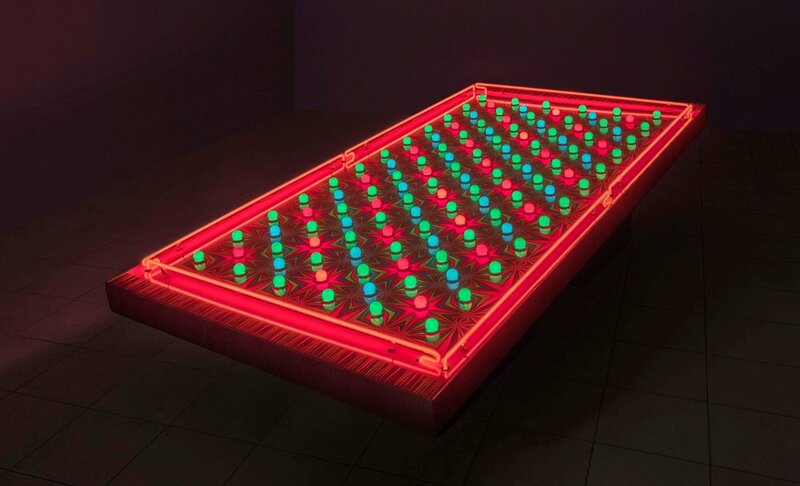 Here they revisit the work and its evocation of the flying carpet of orientalist fantasy in the form of an oversized fairground light sculpture of a floating prayer rug, updating the form to reflect the popular commercial æsthetics of much of contemporary South Asia. Iftikhar Dadi and Elizabeth Dadi have collaborated in their art practice for 20 years. Their work investigates the salience of popular media in the construction of memory, borders, and identity in contemporary globalisation, and the potential of creative resilience in urban informalities. Their work is frequently realised in large-scale installations and has been exhibited internationally, including in the 24th Bienal de São Paulo, Brazil; Third Asia-Pacific Triennial, Brisbane, Australia; Fukuoka Asian Art Triennial, Fukuoka Asian Art Museum, Japan; Liverpool Biennial, Tate Liverpool; Centre Georges Pompidou, Paris; Moderna Museet, Stockholm; Miami Art Museum; Queens Museum of Art, New York; and Whitechapel Gallery, London. Iftikhar Dadi received his PhD from Cornell University. He is an associate professor in Cornell’s Department of History of Art, and also served as chair of the Department of Art (2010–14). Elizabeth Dadi received her B.F.A. from the San Francisco Art Institute.